For the young sports enthusiast, whether it be baseball, basketball, soccer, or football. Your kids favorite will be found on this quilt. 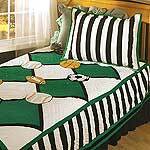 Appliqued balls offset by green diamonds and referee stripes, perfect bedding for the young to old sports enthusiast! Twin Quilt 68" x 86"
Full Quilt 86" x 86"